The Dogwood Trail can be accessed from the Summer House and forms the western border of the Four Seasons Garden. But for the song of birds and the wind in the trees, the Dogwood Trail is quiet and peaceful. 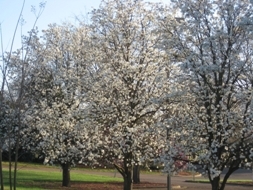 The best time to visit is in spring when the dogwoods are in bloom and the shade-loving plants, such as azaleas, hellebores, and hostas are at their finest. The trail is a wonderful example of an upland forest rim ecosystem, and is home to many native Alabama species that have significant historical, economic, cultural, or aesthetic value to our state. The Dogwood Grove: Beyond the Damson Aquatic Garden, in a green meadow bordered by the Mathews Nature Trail, stands the Dogwood Grove. These young trees are all grafts from the splendid Historic Dogwood Tree. (See The Historic Dogwood Tree page 53 for more on her move to the Garden). In the past, spring visitors would come just to see her in her full glory. Local news outlets even reported when she was at her best. If no one was looking, you could scramble under her sprawling limbs to look at the blue sky beyond the thousands upon thousands of flowers, and it was a magical and breathtaking experience. Thanks to the vision and wisdom of the horticulture staff, seeds were gathered in the fall for several years, so that when she finally succumbed to old age, her offspring would grace this space.